Heather and I went out to the House of Blues in Dallas to see Frank Turner, along with Skinny Lister and Beans on Toast. I’ve seen both Frank Turner and Skinny Lister before, as opening acts for the Dropkick Murphys and Flogging Molly respectively. Heather hadn’t seen either of them before, so it was going to be a great evening. We started out with dinner at FM Smokehouse, which was a disappointment. They’ve cut back their menu pretty severely, to the point where it’s just not worth going anymore. I don’t know if they’re running in to some financial difficulties, but every time we go in, the menu gets smaller and more generic. After that, we got ourselves parked and headed in for the show. The first act up was Beans on Toast, a solo singer. He was ok, but I probably wouldn’t base a ticket purchase on whether or not he was on the lineup. Next up was Skinny Lister, an English roots/punk band that’s a real blast to see. They did a relatively full set, playing some new stuff as well as some things from their first album. The audience was definitely involved, singing along as well as helping the band members crowd surf. After a short intermission, Frank Turner took the stage for his set. He’s gotten airplay on SiriusXM for years, which is how Heather found out about him. And when I saw him as an opening act he did a great job. But he’s definitely improved since then, with a much stronger stage presence and a cleaner production. He was truly enjoyable to listen, and sing along, to. Sadly, all good things must come to an end, and we made our way home to crash out. We took Reese to see Blue Man Group over at the Winspear Opera House today. It’s one of the last things we’re doing before he heads home, but it was definitely something we didn’t want to miss. We’ve seen them before, in Las Vegas, but this show was different. We all had a really good seats, and even Reese enjoyed the show. 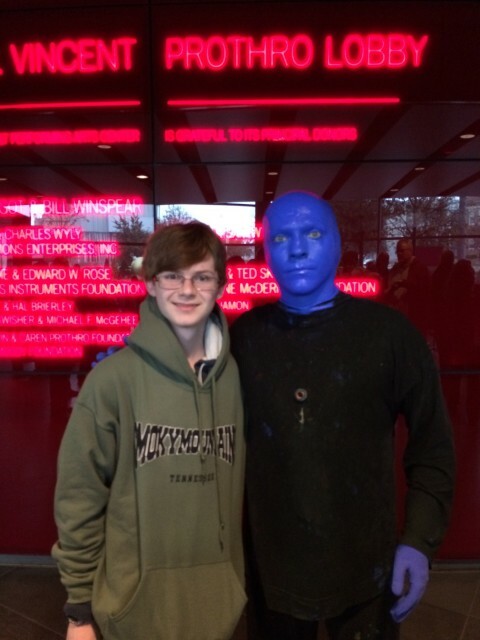 After the show, one of the Blue Men was out front letting people take pictures with him. So, of course, I made Reese got over so that I could take one of him. Reese, Heather, and I headed down to Fort Worth to check out the samurai exhibit at the Kimbell Art Museum. We got there just in time to take a docent led tour of the exhibit, as opposed to just listening to the audio tour. It was a really interesting exhibit, with lots of suits of armor, helmets, and even clothing. There was a lot more variation in the details of the armor, such as the helmets and the decoration on the do, than I was expecting. And the condition of the textiles and other pieces was very impressive. The colors were a little faded by time, but they were still strong. It didn’t take long to go through, and it’s there until the end of August, so please take the time to go. You won’t be disappointed. Today was the last day of the cruise, and we pulled in to Seattle pretty early in the morning. Disembarkation was a little more chaotic than our last cruise thanks to the missing central staircase on the Grand Princess. But we managed to slide in to one of the earlier groups and got off the ship pretty quickly. From there we took a cab over to the hotel, got our luggage dropped off, and snagged some breakfast. We walked back to Pike Place Market and did a little more last minute shopping before heading over to Fado’s, the pub we had wanted to go to on the Friday before we set sail. The food was great, and while we were definitely too tired to make it there last time, it was good that we didn’t miss out on it. While we were there we got to watch a little of the World Cup and Heather got to see her first dive. It was quite amusing. We grabbed a cab and went back to Seattle Center to go to the EMP Museum. They have a sci-fi/fantasy/horror exhibit that we were dying to check out, and it was worth the visit. There were lots of interactive exhibits and props from movies like The Wizard of Oz, Labyrinth, The Princess Bride, as well as props from Star Wars, Stargate, and Game of Thrones. Once we got done with that section we went up to the music exhibits and took in a great Jimi Hendrix exhibit as well as one on Nirvana. We took the monorail back to the hotel, dropped our loot, and headed down to Pike Brewing Company for dinner. We weren’t too hungry so we just ordered appetizers and shared around. Plus a tasting flight of some of their limited and seasonal releases to cap the evening off. We walked back to the hotel in the rain, said our goodbyes to Sandy and David, and settled in for the night. Tomorrow we fly home. For our anniversary, Heather gave me some art books and some painting supplies. I’ve been reading them and experimenting with mixing and blending on some paper, but decided to step it up a little. Michael’s does beginners painting classes in the evening, so I signed up for the floral class. What few supplies I didn’t have were purchased in advance, and I was ready to go. The class was very enjoyable, and I learned quite a bit about basic techniques. I also discovered that some of the paints that I had weren’t that good. The reds and yellows just didn’t want to play nice when blending. I shouldn’t have gotten brown out of a 2:1 ratio of ultramarine blue and cadmium red light. Using the instructor’s better quality red and my blue produced the desired color, so it’s definitely my red. 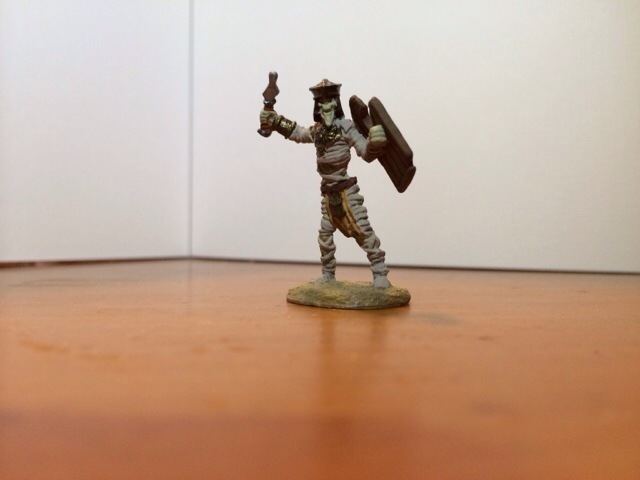 I had a few other issues like that, all with the lighter or more transparent colors that were fixed by using some of the instructor’s paints. The end result looks pretty good, though I can see that I’ve got a lot of work to do on my technique, as well as some upgrades on paints and brushes. I’ll definitely be taking a few more classes because this is a heck of a lot of fun! Today was mostly a driving day, cruising up to Albuquerque, where we are to spend a couple days. We did make a short detour into Hatch, NM to do a little green chile shopping. I picked up some dried chiles and a shirt. Reese, on the other hand, sniffed a few of the chiles and decided they were too spicy. A short time after we got back on the highway, we pulled off to document Heather’s car rolling over 100,000 miles. Our next stop was in Socorro, NM to get some lunch. In keeping with the brewery sub-theme of the trip, we stopped for lunch at Socorro Springs Brewing Company. They served some really delicious food, mostly foodie takes on American and New Mexican cuisine, with their own spin on them. Their tap selection was good, but since we were just passing through, I kept myself to a single beer, a hefe in this case. With full bellies, we got back out on the road and finished the drive in to Albuquerque. We got in to town and made for the Hotel Blue, where we’d be staying for the next two nights. It’s a little boutique hotel close to Old Town, and from what we’ve seen so far, we like it. They offer a free shuttle to and from Old Town, as well as the airport, which we were happy to take advantage of. We spent some time walking around Old Town, doing a little shopping, and enjoying ourselves. Dinner tonight was at La Crêpe Michel, a small French cafe in Old Town. If you’re in the area and in the mood, we really recommend that you check it out. Even Reese, certainly not the most adventurous eater, enjoyed his meal. After dinner we took the shuttle back to the hotel and went to bed. We got up early this morning and headed up to the buffet for breakfast. We got to watch the ship back in to its mooring while we ate, which was really cool. It’s pretty impressive to see how fine a degree of control the captain has over such a large ship. Once we finished eating, we went down to deck 4 and lined up to get off the ship. Disembarking was interesting. They scanned our cruise cards, in effect checking us out, so that they could keep track of who’s on and off the ship. From there we walked up to the Mahogany Bay cruise terminal/shopping center to find our tour guide. We were early, so we wandered around, snickering at the overpriced jewelry and picking up souvenirs. We returned to our queueing area and met up with our guide, who took us to the mini bus that would be our transportation around the island. 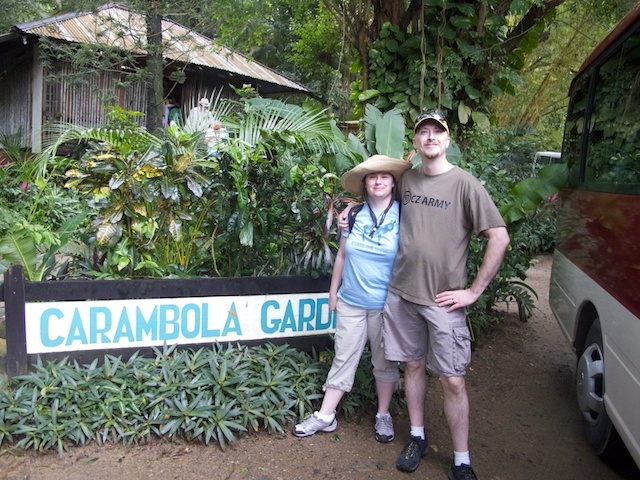 Our first stop was the Carambola Botanical Gardens, where we were guided through some rain forest, learning about many of the plants we’ve used, such as allspice, coffee, and cacao. At the end of the tour, we had a light snack of some fresh local fruit. 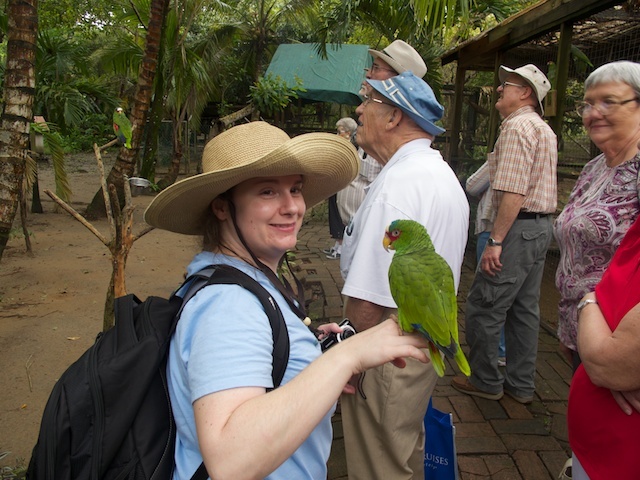 Once back on the bus we went on to Roatan Butterfly Garden. Even though the weather was not cooperating, with some light showers, we weren’t disappointed because they had a number of parrots and other birds there. 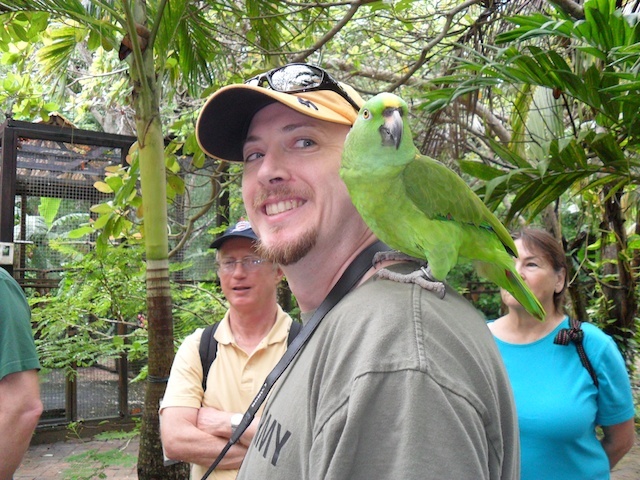 We actually got to handle a few of them, or more accurately, we got to be perches for a few of them. There weren’t many butterflies to be seen due to the weather though. But it was still really cool. Next up was a stop at the West End village to see a cultural show, put on by some members of one of the local tribes, and some shopping. I picked up a post card for Reese and some cashew wine vinegar. Heather found a nice wooden bowl at one of the stores. We then got back on the bus and headed to our last stop, a cameo factory where we got to watch cameos being made. It was very interesting, and they’re definitely works of art. We then boarded the bus to head back to the port. My head had been a little wonky yesterday, and was in full on sinus infection meltdown today, so I was really thankful to have a pharmacy and over the counter antibiotics available. Hopefully a course of azithromycin will knock it down. If not, I’ll be seeing the inside of the ship’s medical center soon. Since we had some free time before the ship sailed, we went back on board to drop off our loot, get some lunch, and pick up our passports to get them stamped. When we got back on the ship, they again scanned our cruise cards and then compared our faces to the pictures they took when we boarded. It was nice to see the security in operation. So, with free hands, we went back to the stores, did a little more shopping, got our passports stamped, and then mailed Reese first post card off. On the way back to the ship for the final time, I picked up a liter of The Macallan scotch in the duty free. We hung out on the promenade and watched the sailaway, then went forward and got some great pictures of the sunset as we were heading out towards Belize. Tonight is going to be another early night because we’ve got to be up before 6:00 AM to get dressed, eat, and meet up in the theater for our excursion by 6:45 AM. Hitching a ride on Heather. Heather and I got a great deal on tickets to Cirque du Soleil‘s new show Kooza. It’s put on in the Grand Chapiteau, and has a great variety of acts and wonderful music. My favorite was the Wheel of Death, two human sized hamster wheels pivoting around a central axle. If you’re confused you should go see the show, it’ll all make sense then. This was my third Cirque show, the second tent show, and I think I’m hooked. Regrouping in the morning we snagged a quick breakfast just off the casino floor and then did a little more walking and shopping. This time we were a little more thorough about hitting the Forum Shops and found a great clothing store called Bettie Page, where Heather found a really nice dress. We struck out on finding a pair of shoes that would go with it, so we’ll have to find another excuse to wear it. After a bit more shopping we went back to The Cosmopolitan for lunch at José Andrés’s China Poblano. The fusion of Chinese and Mexican food was interesting and extremely tasty! We then headed back to get ready for dinner and tonight’s show. Dinner was at Thomas Keller’s Bouchon, a French bistro. The food was delicious, the service was perfect, and really, the entire experience was as close to perfect as we could have hoped. We started out with a charcuterie of salamis and then moved on to the main courses. Heather had the Gigot d’Agneau, a delicious lamb dish and I had the steamed mussels. Both were very, very good. Finally we finished off with some dessert and coffee. I had a lemon tart and Heather had the profiteroles. After dinner we went back through the hotel to the Blue Man Theater for tonight’s show. Thanks to some great advice, I booked the VIP experience when I purchased the tickets. We got good seats, which were supposed to be outside of the splatter zone (they were not) and a one-on-one meet and greet with one of the Blue Men after the show. The show was a lot of fun, with great music mixed in with physical comedy and a lot of mess. As I mentioned earlier, the splatter zone is rather loosely defined. I managed to wear a bit of banana pudding during one of the acts, but it’s all good. After the show finished we were escorted to a small room where one of the Blue Men came out to meet us. He was a lot of fun to talk to, and yes, he did break character. We got autographs, had some good laughs, and then headed back to get some sleep.